Providing you with 27 years of experienced service! Specialising in the installation, service and repair of split system, ducted air conditioning and commercial refrigeration. Providing 27 years of experienced service! Below Zero is a local Victor Harbor owned and operated business offering comprehensive air conditioning and refrigeration services to Fleurieu Peninsula, concentrating on Victor Harbor, Yankallia, Goolwa, Strathalbyn and surrounding areas. Below Zero is your one-stop shop for all air conditioning and refrigeration needs ranging from delivery and installation to service, repair and maintenance. We cater to residential properties as well as commercial businesses and industrial set-ups. Air Conditioning: including supply, installation and repair of ducted as well as split system air conditioners for residential, commercial and industrial establishments. 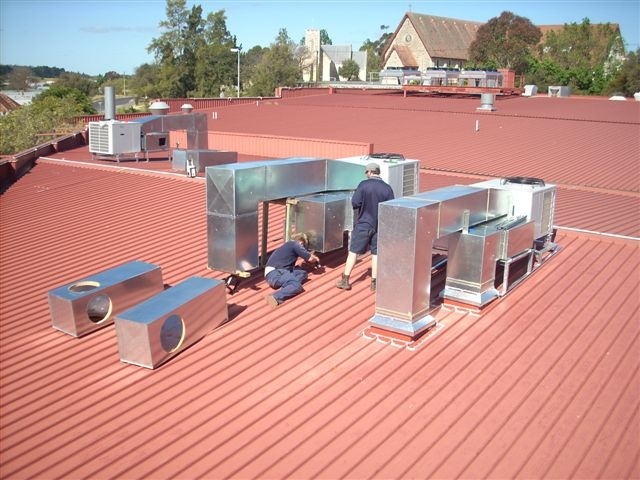 Our technicians are also skilled in installation and service of central plant cooling, heating and ventilation systems for large commercial properties. Refrigeration: Below Zero supplies a vast range of quality cool rooms, freezer rooms and other commercial refrigeration equipment to restaurants, cafes, pubs, supermarkets, schools and medical facilities. At Below Zero, our reputation is built on our quality workmanship, rich experience and prompt, professional service. We treat every project with utmost sincerity and precision. We understand a good quality air conditioner or refrigeration equipment is an investment for your home or business. Consequently, we have designed in place standardised processes for maximum efficiency. Skilled Technicians: At Below Zero, we are extremely proud of our workforce comprising of qualified and highly skilled technicians. Each of the technicians is hand-picked and trained by the owners. We ensure they undergo frequent industry training to keep them up-to-date with the latest technological advancements. Furthermore, for your complete peace of mind, each of our technicians comes with a national police clearance. Experience: We have been in the aircon and refrigeration industry for over 23 years. This rich experience has equipped us with the knowledge and skill to service almost any brand aircon or refrigeration unit. After-Sales Assistance: Not only do we deliver and install your air conditioner or refrigeration equipment, but we also offer after-sales repair assistance. If your equipment breaks down or stops performing at its peak efficiency, give our expert technicians a call and we will come back to fix it! Prompt Service: Below Zero understands that equipment can break down and such breakdowns can quickly translate to loss of dollars for you if not fixed quickly. Consequently, we have a well-equipped fleet of mobile vans to reach you anywhere in the Fleurieu Peninsula. Below Zero is not only owned by a local family, but we also employ local families, which helps support the local economy. Below Zero are proud sponsors of several local sporting clubs across the Fleurieu Peninsula. We are enthusiastic about being an active supporter of our community. During the recent heat wave our Daikin air conditioning system gave up. Sam from Below Zero got to our place quickly and advised us that it wasn’t economical to fix. They had a new Daikin air conditioner installed in 3 days and we couldn’t be happier with the service or the price. I run a commercial facility in Strathalbyn and it is important that our air-conditioning system keeps an average mean temperature. Below Zero were involved in the design of the system, they installed the system and are responsible for the on-going air conditioning service and maintenance. We would highly recommend Below Zero as a very professional air conditioning comapny. CALL BELOW ZERO TODAY FOR PROFESSIONAL & QUALITY AIR CONDITIONING & REFRIGERATION SOLUTIONS.